If you think your dishes aren’t getting as clean as they used to, you’re probably right! As of July 1 of this year, all the detergent makers removed phosphates from their detergents. This has caused a rash of washability complaints because the phosphates did a number of important things to help the detergent clean better. For example, phosphate causes food to break apart and dissolve by removing the calcium that binds foods together. It also reduces spotting and filming during the wash cycle. Phosphate also helps break up and get rid of grease, helps control water hardness, and suspends soils within the wash water so they are not redistributed onto the plates. The old-formula dishwashing detergents had about 30% phosphates. Now, with the phosphates removed, the calcium is free to run around inside the dishwasher slurry causing trouble. 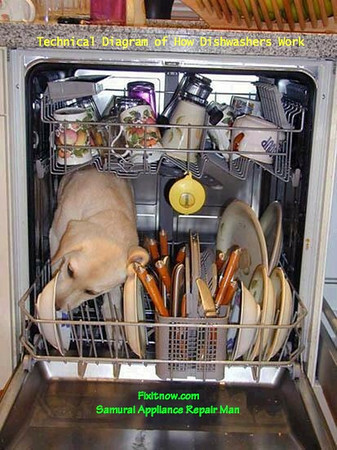 It’s a good idea to run Affresh every few loads, too, to de-gunkify the dishwasher’s innards. This entry was posted in Dishwasher Repair on August 22, 2010 by Samurai Appliance Repair Man.